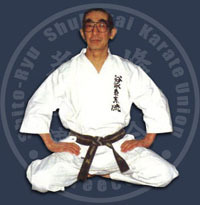 Founder of ShukokaiThe Shukokai school of karate was founded by Tani Sensei. He began his study of karate at junior high school practising Goju Ryu and continued his training at the Doshisha University in Kyoto where he studied under Chojun MIYAGI sensei, the great karate Master (who was the founder of Goju Ryu and who had trained under HIGAONNA Sensei). Later when Sensei Miyagi returned to Okinawa, Tani Sensei trained under Kenwa MABUNI sensei.After the Second World War, Tani Sensei started to teach Karate in an open air car park in the centre of Kobe. His group (Shukokai) soon grew and one year later he built his own Dojo attached to his house. In 1946 Tani Sensei was presented with the scroll of succession from Mabuni Sensei and was given permission to start up his own school, Tani-Ha Shito-Ryu. Master Tani passed away on Sunday 11th January 1998.